Vassivière Lake, one of the largest artificial lakes in France, covers nearly 1,000 hectares. Thousand hectares of pure water, 45 km of shore, six supervised beaches, three marinas, 300 km of hiking ... Vassivière Lake is the largest lake in the Limousin, and is a special area for ​​relaxation, recreation and sports. Lake Vassivière was created with the construction of the hydroelectric dam in 1949 to supply the region with electricity and energy needs of the post war. However, the imprint of man has given way to a harmonious landscape, often compared to the Norwegian fjords. In addition to its energy supply, Vassivière Lake is a haven for many activities. It is the largest area for recreation and sport in the region. For anglers, perch, trout, roach, tench and pike will bite certainly the hooks. At the heart of an unspoilt countryside strewn with moorland and heather, tourists and visitors will find a thousand and one activities. The six beaches with supervised play areas for children will delight swimmers. Around the lake, there is the road called "circumlacustre" which can be ridden either by mountain bike, on foot or on horseback... There's something for everyone! Info: Auberge du Bois De L'Etang is located in Peyrat-le-Château 7 km from the Vassivière Lake and offers a bar, a restaurant, meeting and banquet facilities, and free Wi-Fi in public areas. Info: Le Bellerive hotel is located in Peyrat-le-Chateau village centre, and offers rooms with free Wi-Fi access and views over the local lake and surrounding hillsides. It is an ideal location for discovering the Limousin region. Info: The Logis les Voyageurs is located in Tarnac in the Corrèze region. 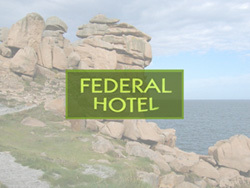 The hotel is close to Chammet golf course and offers free parking. Guest rooms at the Logis les Voyageurs are equipped with a TV and en suite bathroom. Info: Château de la Chassagne dates from the 15th century and is surrounded by a 5-acre park, in the countryside of the Creuse region. A continental breakfast is included and you can enjoy fishing in the lake.